Magnetism is one of the oldest recognised material properties. Known since antiquity, records from the 3rd century BC describe how lodestone, a naturally occurring magnetised ore of iron, was used in primitive magnetic compasses. Today, thanks to the theory of quantum mechanics we now understand the nature of magnetism, too, with the concept of spin explaining the behaviour of elementary particles such as electrons in the material that make it magnetic. Spin, a property of sub-atomic particles such as electrons and quarks, makes each individual electron behave as if it were a tiny magnetic compass needle. The millions or billions of electron spins in a piece of material interact with each other in various ways and stabilise to form the different possible magnetic states found in solid matter. Taken together in such large numbers, the spin of the material’s electrons grants the same magnetic properties to the material itself. Magnetism is essential for the basic trappings of modernity: magnetic materials form the basis of modern electronics and information storage. With this in mind, scientists have pursued the discovery of materials with entirely new magnetic behaviours or new states of matter with unprecedented and potentially beneficial properties. One is that of a quantum spin liquid, first proposed by the Nobel Prize-winning theoretical physicist PW Anderson in the early 1970s. In a paper published in the journal Nature Materials, a research team led by Professor Stephen Nagler at the Oak Ridge National Laboratory in the US has demonstrated the quantum spin liquid nature of the magnetic material ruthenium trichloride (α-RuCl₃). How do quantum spin liquids form? Quantum spin liquids are frequently found in a class of materials known as frustrated magnets. In a conventional magnet, the interactions between spins result in stable formations, known as their long-range order, in which the magnetic directions of each individual electron is aligned. In a frustrated magnet, the arrangement of electron spins prevents them from forming an ordered alignment, and so they collapse into a fluctuating, liquid-like state. In a true quantum spin liquid, the electron spins never align, and continue to fluctuate even at the very lowest temperatures of absolute zero, at which the spins in other magnetic states of matter would have already frozen. The conditions required for a quantum spin liquid to form are often found in nature. 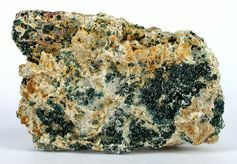 The most famous example is the copper-based mineral Herbertsmithite, for which there is significant evidence to suggest that a quantum spin liquid state exists within the frustrated magnetic layers of copper ions that make up its structure. Where do we find quantum spin liquids? A challenge for scientists is to recreate the conditions required to synthetically grow candidate quantum spin liquid materials in the laboratory to allow for a complete understanding of their properties. Quantum spin liquids’ evasive character make it notoriously difficult to confirm their existence and pinpoint their exact nature. The presence of a quantum spin liquid can be inferred from a lack of alignment of electron spins, but definitive confirmation is tricky: absence of evidence is not evidence of absence, as the adage goes. A more sophisticated approach is to uncover the more distinctive and unique characteristics of the quantum spin liquid to allow for a positive confirmation. This is why Nagler’s study is particularly noteworthy. In experiments using neutron spectroscopy, the team revealed that α-RuCl₃ realises something extremely close to a special flavour of quantum spin liquid called a Kitaev spin liquid. A prerequisite for this particular quantum spin liquid state is that the spins of the magnetic ruthenium ions form a frustrated honeycomb network: a layered, two-dimensional hexagonal structure, similar to that assumed by carbon atoms in graphite. In their experiment, a beam of neutron particles created by a particle accelerator was scattered from the sample of α-RuCl₃ transferring energy between the neutrons and the sample in the process. This energy transfer was quantified by a set of detectors surrounding the sample, and the response observed fits that described by the theory developed for the Kitaev quantum spin liquid in particular. What can we do with quantum spin liquids? We now recognise that the quantum spin liquid comes in several different varieties with subtly different properties, but that they all share the ability to support peculiar quantum mechanical phenomena. This is exciting, and not just from a purely scientific perspective: these states could be used in the development of quantum computers and other transformative quantum technologies that are expected to provide revolutionary changes to how we process and store data throughout the 21st century. In the age of quantum computing, we will be able to perform calculations that are currently unsolvable on even the most powerful supercomputers of today. This will allow for breakthroughs in a vast array of fields in which we are tackling some of the biggest challenges of our time, from drug discovery to the design of smarter materials for a whole host of applications. As we discover more candidate quantum state liquid materials and better understand their behaviour, we will unravel ever more exotic physics and discover ways to manipulate and control this novel state of matter to our advantage.